Even President Abraham Lincoln missed the fact, in his first inaugural address, that there were two Resolutions passed by the Second Continental Congress declaring United States Independence. The first resolution declaring independence actually preceded the Declaration of Independence, which most U.S. Citizens know was passed on July 4th, 1776. The adoption of this resolution on the 2nd of July, 1776, was the termination of all lawful authority of the King over the thirteen United Colonies — made by this act of the Congress thirteen United States of America. The Americans now owed no more allegiance to England than they owed to Germany, or France, or Spain ; they were no longer rebels or insurgents ; they claimed their recognition as one among the family of nations of the earth, and they maintained and sustained the claim. It was in the end acknowledged by the King of England himself. After the 2nd of July, 1776, the English armies, with their Hessian allies, were the invaders of America, sent to reduce the independent States to unconditional submission to the Crown of England. And yet this day has no place in Lord Mahon's "history," the day on which was consummated the most important measure that had ever been debated in America. Amazingly, in the 21st Century, the day the United States actually declared its independence still remains a mere footnote in United States history. 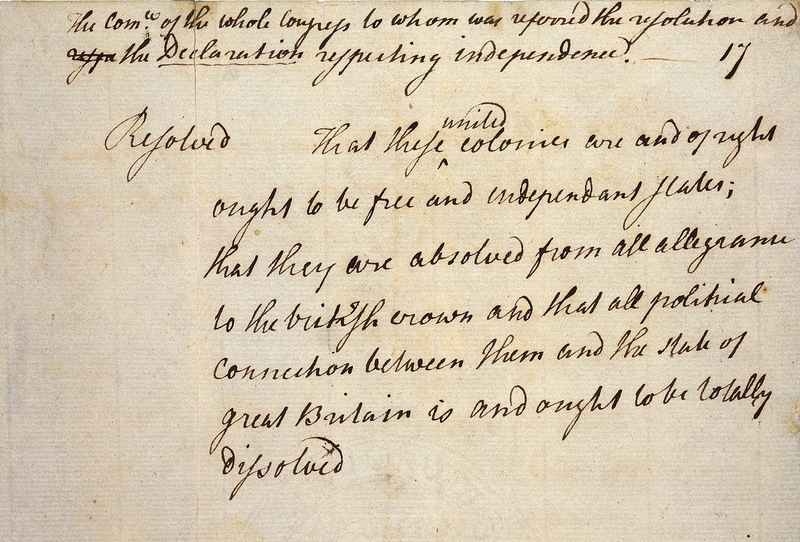 Certain resolutions respecting independency being moved and seconded, Resolved, That these United Colonies are, and of right ought to be, free and independent States, that they are absolved from all allegiance to the British Crown, and that all political connection between them and the State of Great Britain is, and ought to be, totally dissolved. The Grand Question of Independence was brought upon the Tapis the Eighth Instant, and after having been cooly discussed, the further Consideration thereof was on the 10th postponed for three Weeks, and in the mean Time, least any Time should be lost in Case the Congress should agree to the proposed Resolution of Independence, a Committee was appointed to prepare a Declaration to the Effect of said Resolution, another a Form of Confederation, and a Third a Plan for foreign Alliances. A Committee of Five was chosen with Thomas Jefferson of Virginia being picked unanimously as its first member. Congress also chose John Adams, Benjamin Franklin, Robert R. Livingston, and Roger Sherman. The committee assigned Jefferson the task of producing a draft Declaration, as proposed in Thomas Paine’s Common Sense, for its consideration. 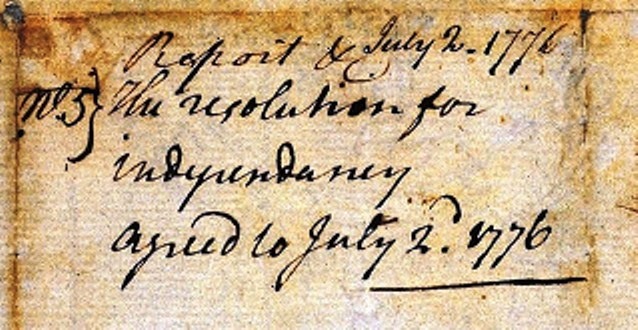 Jefferson's writing of the original draft took place in seventeen days between his appointment to the committee until the report of draft presented to Congress on June 28th. Thomas Jefferson drew heavily on George Mason's Virginia Declaration of Rights (passed on June 12, 1776), Common Sense, state and local calls for independence, and his own work on the Virginia Constitution. Edited By: Naomi Yavneh Klos. Ph.D. 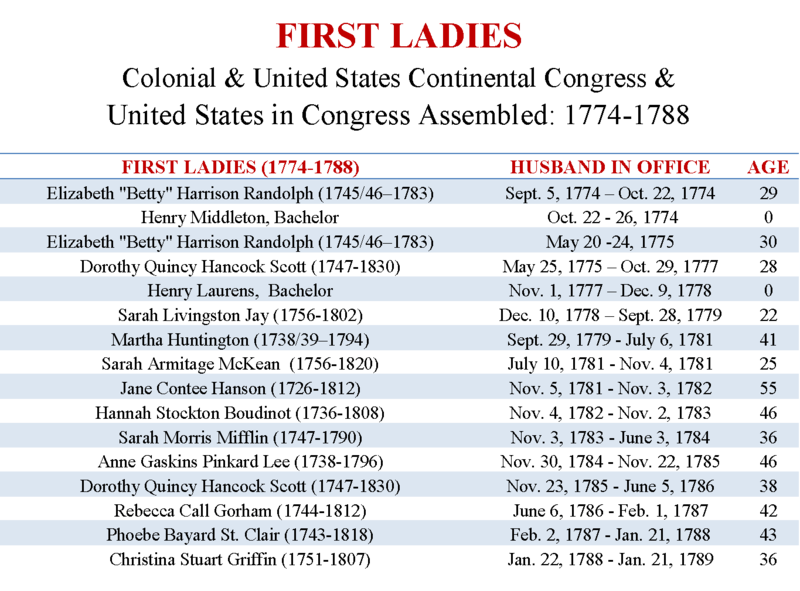 The entire committee reviewed the Declaration after Franklin and Adams's changes. After much discussion 26 additional changes were made from Jefferson's original draft. The Committee presented it to Congress on Friday June 28th which ordered it to lie on the table. On June 29th a massive British fleet reached the entrance to the Hudson River. The British war fleet arrives in New York Harbor consisting of 30 battleships with 1200 cannon, 30,000 soldiers, 10,000 sailors, and 300 supply ships, under the command of General William Howe and his brother Admiral Lord Richard Howe. 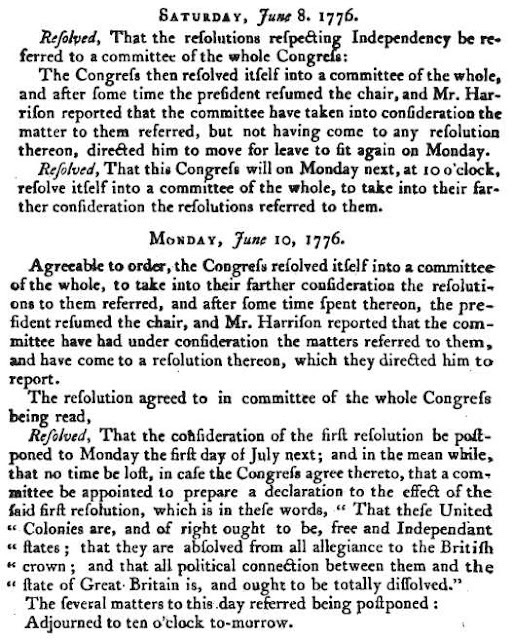 On Monday the 1st of July the house resolved itself into a committee of the whole & resumed the consideration of the original motion made by the delegates of Virginia, which being again debated through the day, was carried in the affirmative by the votes of N. Hampshire, Connecticut, Massachusets, Rhode island, N. Jersey, Maryland, Virginia, N. Carolina, & Georgia. South Carolina and Pennsylvania voted against it. Delaware having but two members present, they were divided. The delegates for New York declared they were for it themselves, & were assured their constituents were for it, but that their instructions having been drawn near a twelvemonth before, when reconciliation was still the general object, they were enjoined by them to do nothing which should impede that object. They therefore thought themselves not justifiable in voting on either side, and asked leave to withdraw from the question, which was given them. The Committee rose & reported their resolution to the house. Mr. Rutlege of South Carolina then requested the determination might be put off to the next day, as he believed his collegues, tho' they disapproved of the resolution, would then join in it for the sake of unanimity. The ultimate question whether the house would agree to the resolution of the committee was accordingly postponed to the next day. On the morning of July 2, 1776 the New York Delegates wrote the newly elected Provincial Congress in NYC for instructions as the vote for independence was eminent. The important Question of Indepency was agitated yesterday in a Committee of the whole Congress, and this Day will be finally determined in the House. We know the Line of our Conduct on this Occasion; we have your Instructions, and will faithfully pursue them. New Doubts and Difficulties however will arise should Independency be declared; and that it will not, we have not the least Reason to expect nor do we believe that (if any) more than one Colony (and the Delegates of that divided) will vote against the Question; every Colony (ours only excepted) having withdrawn their former Instructions, and either positively instructed their Delegates to vote for Independency; or concur in such Vote if they shall judge it expedient. What Part are we to act after this Event takes Place; every Act we join in may then be considered as in some Measure acceding to the Vote of Independency, and binding our Colony on that Score. Indeed many matters in this new Situation may turn up in which the Propriety of our voting may be very doubtful; tho we conceive (considering the critical Situation of Public Affairs and as they respect our Colony in particular invaded or soon likely to be by Powerful Armies in different Quarters) it is our Duty nay it is absolutely necessary that we shoud not only concur with but exert ourselves in forwarding our Military Operations. The immediate safety of the Colony calls for and will warrant us in this. Our Situation is singular and delicate No other Colony being similarly circumstanced with whom we can consult. We wish therefore for your earliest Advice and Instructions whether we are to consider our Colony bound by the Vote of the Majority in Favour of Indepency and vote at large on such Questions as may arise in Consequence thereof or only concur in such Measures as may be absolutely necessary for the Common safety and defence of America exclusive of the Idea of Indepency. We fear it will be difficult to draw the Line; but once possessd of your Instructions we will use our best Endeavours to follow them. We are with the greatest Respect your Most Obedt Servts. I returned to this City from Elizt. Town, & to my great mortification am informed that our Convention influenced by one of Gouverneur Morris' vagrant Plans have adjourned to the White Plains to meet there tomorrow. I have but a moments time to answer your letter. I am mortified at the removal of our convention. I think as you do on the subject. If my fears on account of your health would permit I shd. request you never to leave that volatile politician a moment. I have wished to be with you when I knew your situation. The Congress have done me the honour to refuse to let me go. I shall however apply again to day. I thank God I have been the happy means of falling on a expedient which will call out the whole militia of this country in a few days-tho' the Congress had lost hopes of it from the unhappy dispute & other causes with which I will acquaint you in a few days. We have desired a Genl to take the Command. I wish Mifflin may be sent for very obvious reasons. If you see [him] tell [him] so from me. I have much to say to you but [not a] moment to say it in. God be with you. Despite a second British Fleet arriving in Charleston, South Carolina's harbor on June 1st, 1776, Delegate Edward Rutledge urged his fellow delegates to vote for the resolution. 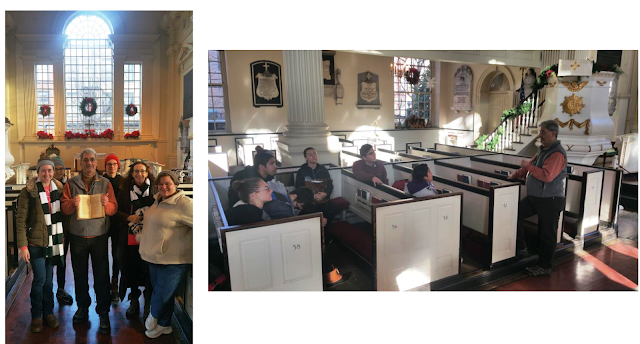 Arthur Middleton, son of First Continental Congress President Henry Middleton, shucked his father's loyalist wishes and joined his fellow Delegates in changing the colony's position from a July 1st no to an unanimous yes for independence. Finally Caesar Rodney, who was summoned by fellow delegate Thomas McKean, [vii] arrived suffering from a serious facial cancer and afflicted with asthma after riding 80 miles through the rain and a lightening storm. He broke Delaware's 1 to 1 deadlock by casting the third vote for independence. All 12 colonies, except for New York whose delegates were not empowered to vote, adopted the July 2nd, 1776 Resolution for Independency. 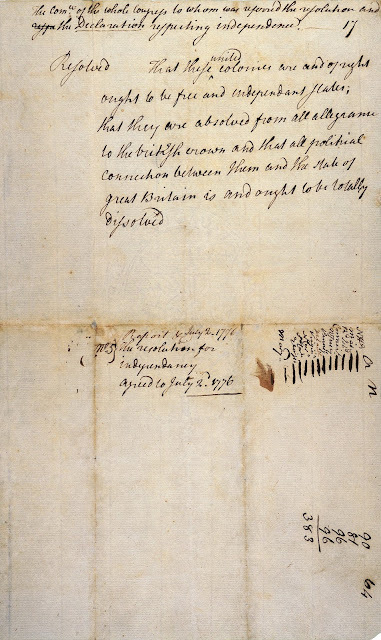 Resolution for Independency which was passed on July 2, 1776. 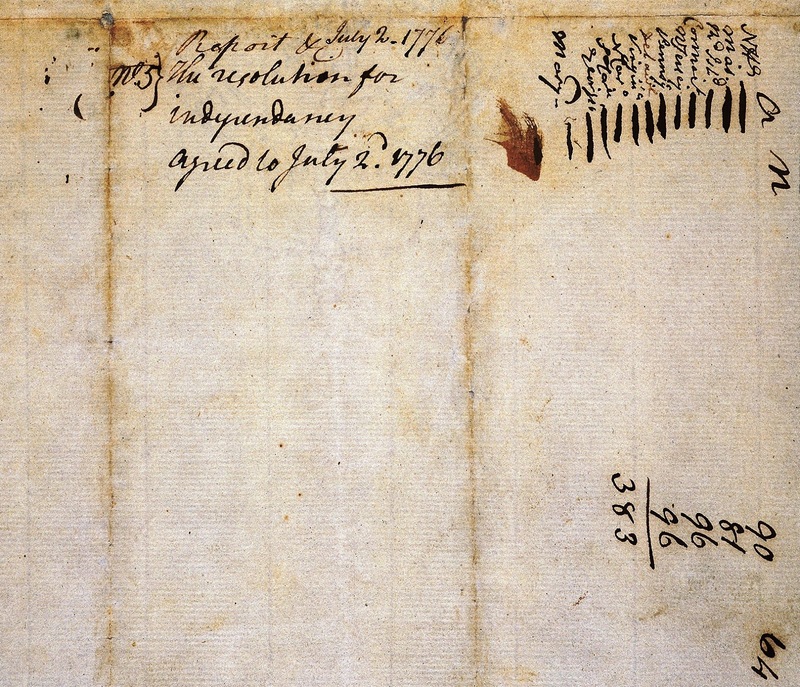 United Colonies of America roll call vote result written on the July 2, 1776 "Resolution for Independency" which is clearly marked on this original Continental Congress manuscript passed on July 2, 1776. 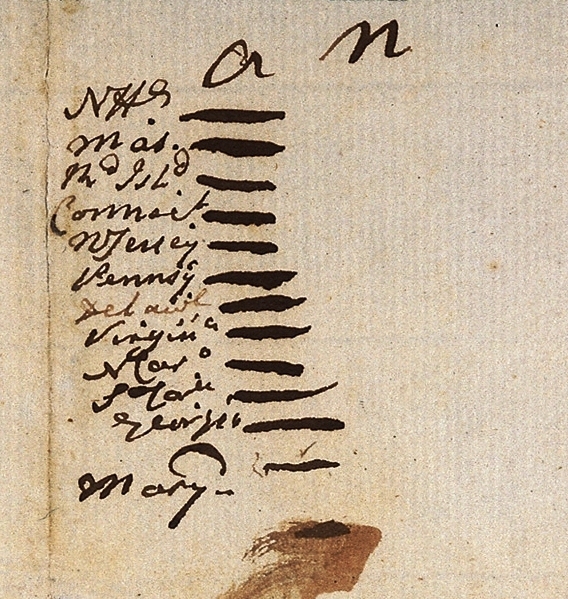 The roll indicates that New Hampshire was the first State to vote for Independence. New York is not listed as the delegation abstained from the vote - Image courtesy of the Papers of the Continental Congress, 1774-1783; Records of the Continental and Confederation Congresses and the Constitutional Convention, 1774-1789, Record Group 360; National Archives. “The Subject had been in Contemplation for more than a Year and frequent discussions had been had concerning it. At one time and another, all the Arguments for it and against it had been exhausted and were become familiar. I expected no more would be said in public but that the question would be put and decided. Mr. Dickinson however was determined to bear his Testimony against it with more formality. He had prepared himself apparently with great Labour and ardent Zeal, and in a Speech of great Length, and all his Eloquence, he combined together all that had before been written in Pamphlets and News papers and all that had from time to time been said in Congress by himself and others. He conducted the debate, not only with great Ingenuity and Eloquence, but with equal Politeness and Candour: and was answered in the same Spirit.No Member rose to answer him: and after waiting some in hopes that some one less obnoxious than myself, who was still had been all along for a Year before, and still was represented and believed to be the Author of all the Mischief, I determined to speak. It has been said by some of our Historians, that I began by an Invocation to the God of Eloquence. This is a Misrepresentation. Nothing so puerile as this fell from me. I began by saying that this was the first time of my Life that I had ever wished for the Talents and Eloquence of the ancient Orators of Greece and Rome, for I was very sure that none of them ever had before him a question of more Importance to his Country and to the World. They would probably upon less Occasions than this have begun by solemn Invocations to their Divinities for Assistance but the Question before me appeared so simple, that I had confidence enough in the plain Understanding and common Sense that had been given me, to believe that I could answer to the Satisfaction of the House all the Arguments which had been produced, notwithstanding the Abilities which had been displayed and the Eloquence with which they had been enforced. Mr. Dickinson, some years afterwards published his Speech. I had made no Preparation beforehand and never committed any minutes of mine to writing. JOURNALS OF CONGRESS. CONTAINING THE PROCEEDINGS FROM JANUARY 1, 1776, TO JANUARY 1, 1777, York-town, Pa.: Printed by John Dunlap, 1778, 520, xxvii pp, - This volume of the Journals of Congress, opened to the July 2nd, 1776 proceedings, is one of the rarest of the series issued from 1774 to 1788, and has a peculiar and romantic publication history. 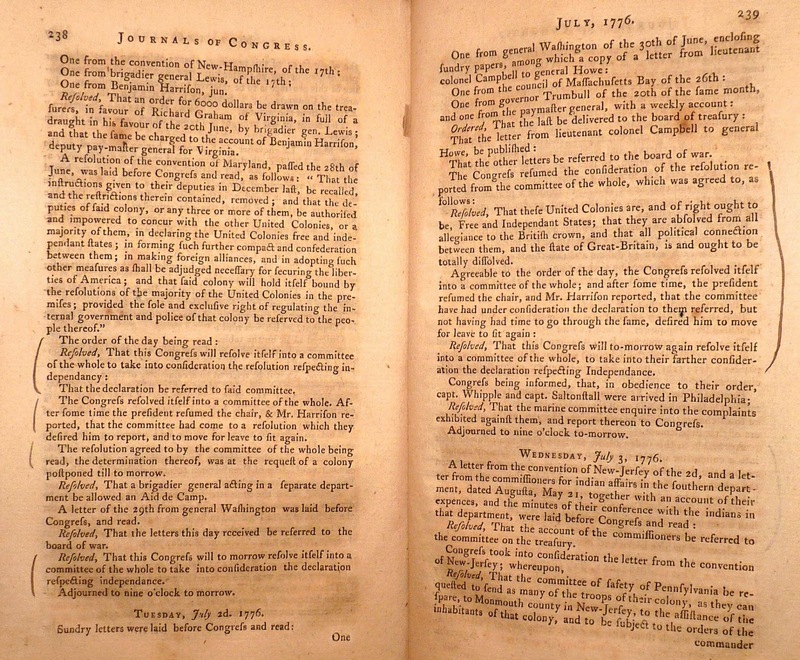 Textually the Journals cover all the 1776 events, culminating with the Declaration of Independence on July 4th, an early printing of which appears in the Journals with the names of the signers, as well as the Resolution for Independency and all of the other actions of Congress for the year. From 1774 to 1777 the printer of the Journals of Congress was Robert Aitken of Philadelphia. In 1777 he published the first issue of the Journals for 1776, under his own imprint. This was completed in the spring or summer. In the fall of 1777 the British campaign under Howe forced the Congress to evacuate Philadelphia, moving first to Lancaster and then to York, Pennsylvania. The fleeing Congress took with it what it could, but, not surprisingly, was unable to remove many copies of its printed Journals, which would have been bulky and difficult to transport. Presumably, any left behind in Philadelphia were destroyed by the British, accounting for the particular scarcity of those volumes today. Among the material evacuated from Philadelphia were Aiken's printed sheets of pages 1-424 of the 1776 Journals. Having lost many complete copies in Philadelphia, and not having the terminal sheets to make up more copies, Congress resolved to reprint the remainder of the volume. John Dunlap the printer of the July 4th Declaration of Independence Broadside, unlike Aiken, had evacuated his equipment. Consequently, the Continental Congress appointed Dunlap their new printer on May 2, 1778. Dunlap then reprinted the rest of the 1776 volume (coming out to a slightly different pagination from Aitken's version). Dunlap added, under his imprint at York, a new title page along with a notice on the verso of his appointment as printer to Congress. This presumably came out between his appointment on May 2 and the return of Congress to Philadelphia in July 1778. Yesterday the greatest Question was decided, which ever was debated in America, and a greater perhaps, never was or will be decided among Men. 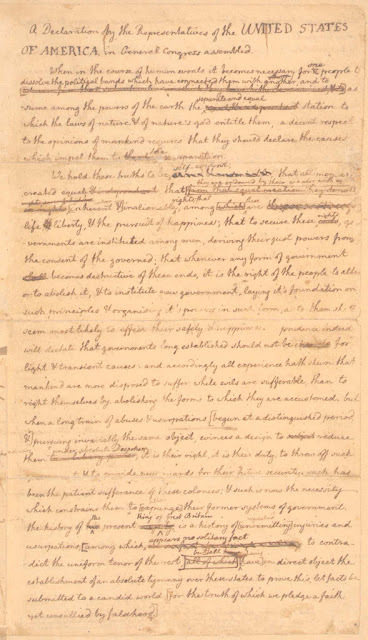 A Resolution was passed without one dissenting Colony "that these united Colonies, are, and of right ought to be free and independent States, and as such, they have, and of Right ought to have full Power to make War, conclude Peace, establish Commerce, and to do all the other Acts and Things, which other States may rightfully do." The start of the United States of America has been a matter of debate since the Second Continental Congress set July 4th -- and not July 2nd -- as the nation's “birthday.” Since then, historians have written volumes denoting July 4th as U.S. Independence Day, despite independence having been declared two days earlier with the enactment of Richard Henry Lee’s Resolution for Independency. Clearly, the Declaration of Independence proclaimed why “… these United Colonies are, and, of right, ought to be, Free and Independent States …” and its content served to justify the Colonial Continental Congress July 2nd vote declaring independence. 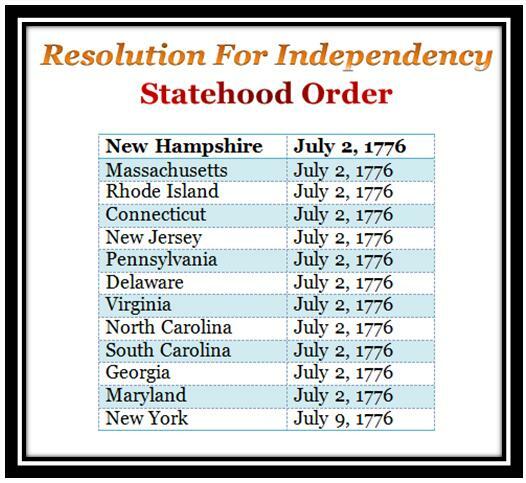 But why does this date, July 4th, override the actual day the 12 Colonies severed their allegiance to Great Britain? On the other hand, it is also true that in Thomas Jefferson’s Declaration of Independence drafts, the word “States” was substituted for “Colonies” in the stile, or name, “United Colonies of America.” It is also true that Jefferson’s substitution was in accordance with Lee’s June 8th resolution that asserted the “United Colonies” were to be “free and independent States.” The United States of America name, however, would not be utilized on any resolutions or bills passed by Congress during the July 2nd - 4th, 1776 interval. 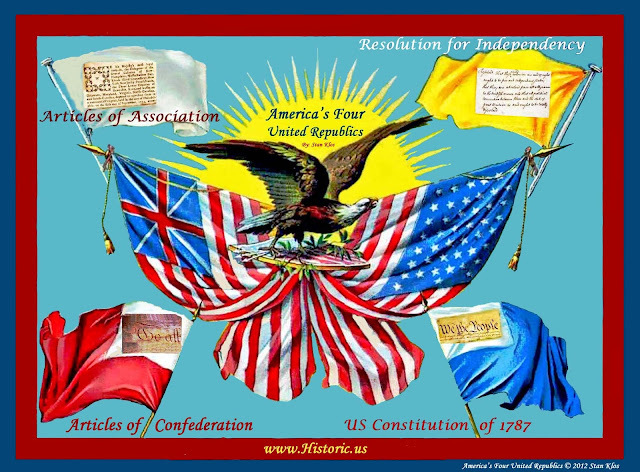 We must, therefore, recognize the fact that the name was officially adopted until the July 4th, 1776 passage of the Declaration of Independence and not on July 2nd with the enactment of the Resolution for Independency. 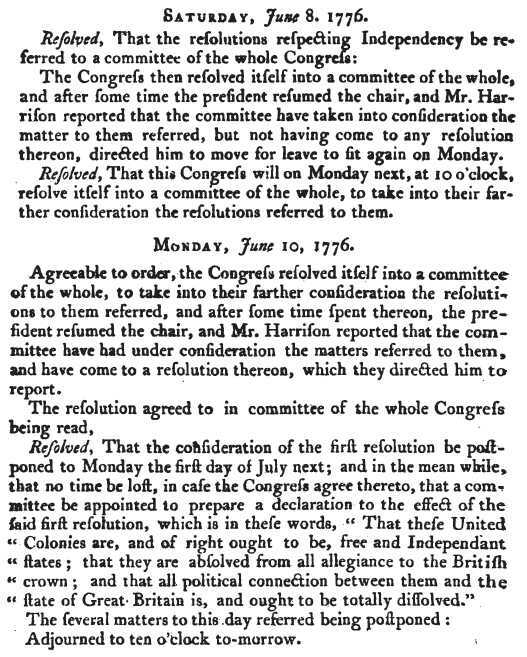 This circumstance, coupled with the nearly completed Declaration of Independence being laid before the members on June 28th and present during the July 2nd vote, perhaps explicates why the 4th and not the 2nd was designated Independence Day by the Continental Congress and was accepted as such by the then future congresses of the United States of America. "That the Declaration be authenticated and printed. That the committee appointed to prepare the Declaration superintend and correct the press. 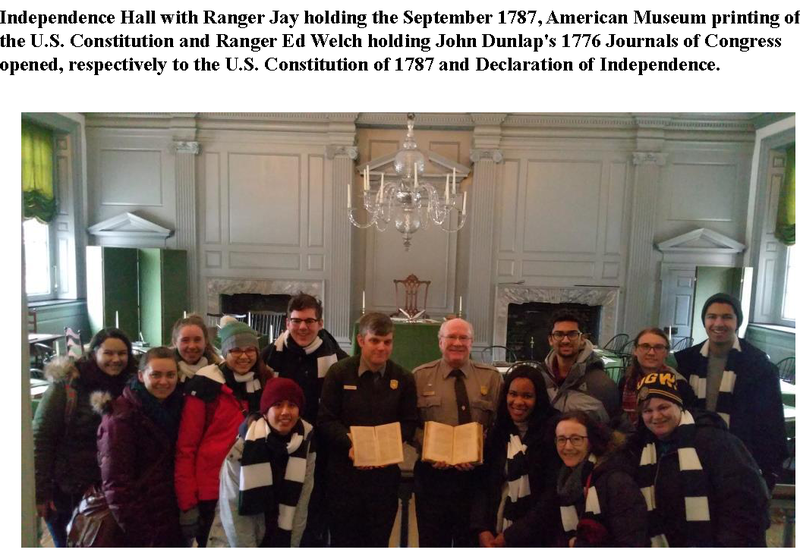 That copies of the Declaration be sent to the several assemblies, conventions, and committees or councils of safety, and to the several commanding officers of the Continental troops; that it be proclaimed in each of the United States, and at the head of the army. " All this was done. It was also printed and circulated among the people, in all the cities, towns, and villages, wherever a printing press was found. It was read everywhere — in churches, in the courts, at all gatherings of the people, and in every private company and family circle. It was this universal diffusion of the Declaration that made the 4th of July the great festival day of the nation, instead of the 2nd day of July, the real birthday of American freedom. The United Colonies of America severed their allegiance to Great Britain on July 2nd, 1776. The new independent republic of free and independent states also enacted war resolutions on the Second, Third, and Fourth of July before passing the Declaration of Independence. 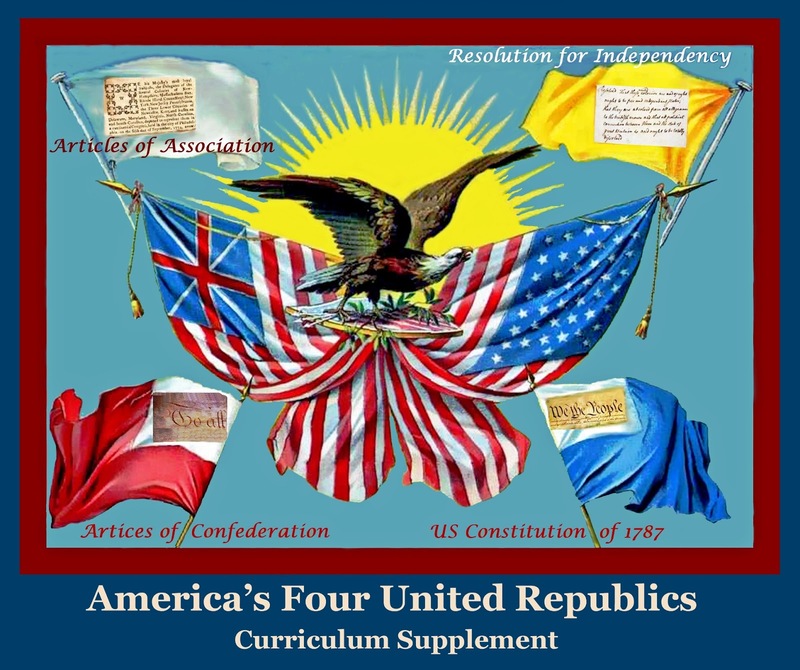 This Assembly, just like Carpenters’ Hall’s unnamed Congress, formed a new United American Republic by enacting bills, resolutions and other legislation on behalf of their now independent states. July 2nd, 1776, therefore, marks the end of the United Colonies of America and the beginning of the Second United American Republic: The United States of America, Thirteen Independent States United in Congress. At the Philadelphia Convention on May 30, 1787, Virginia Governor and member Edmund Randolph moved to rename the United States, the “National Government of America.” This name would remain as part of the current U.S. Constitution draft until June 20th, 1787, when it was moved by Mr. Oliver Ellsworth, seconded by Mr. Nathaniel Gorham “… to amend the first resolution reported from the Committee of the whole House so as to read as follows -- namely, Resolved that the government of the United States ought to consist of a Supreme Legislative, Judiciary, and Executive. On the question to agree to the amendment it passed unanimously in the affirmative.” Max Farrand, The Records of the Federal Convention of 1787. New Haven: Yale University Press, 1911. After the passage of Lee's resolution the Continental Congress enacted that "In obedience to their order, Captain Whipple and Captain Saltonstal were come to Philadelphia; Whereupon, Resolved, That the Marine Committee be directed to enquire into the complaints exhibited against them, and report to Congress." On the third of July seven different resolutions were passed, and finally on the Fourth of July they “Resolved, That an application be made to the committee of safety of Pennsylvania for a supply of flints for the troops at New York: and that the colony of Maryland and Delaware be requested to embody their militia for the flying camp, with all expedition, and to march them, without delay, to the city of Philadelphia.” All were enacted before the Declaration of Independence was adopted. Journals of the Continental Congress, July 2-4, 1776. 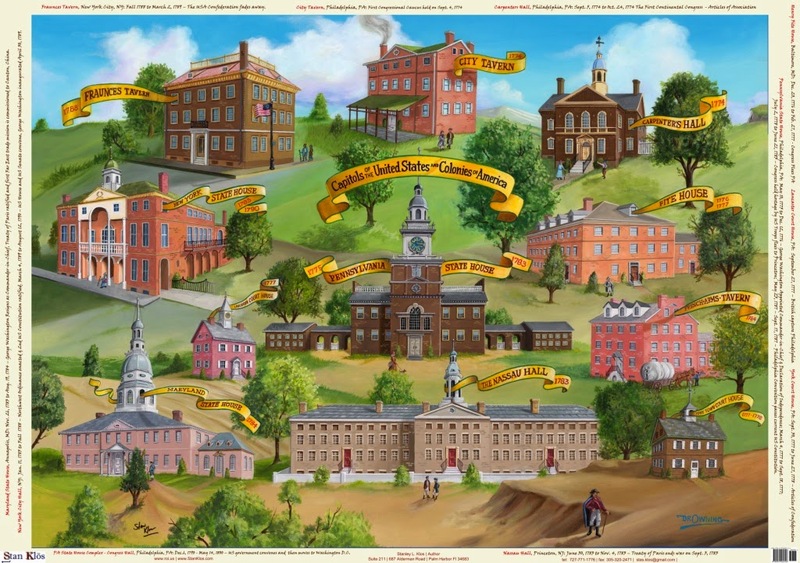 On September 5, 1774 the delegates first assembled at Carpenters Hall but did not formalize the name of that body as a “Continental Congress,” until October 20, 1784.